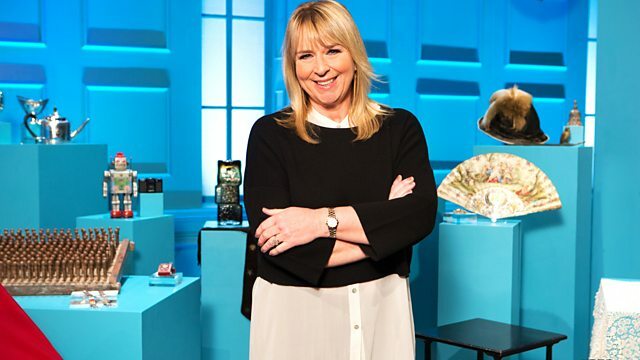 It's the show that combines quizzing with our curiosity for antiques. We have three pairs of contestants who are ready to play. So the aim of the game is to amass the most valuable collection. Would you please welcome Natasha Raskin? -I did, I loved that. I'll use that again, thank you very much. Are you ready for a good game today? I am, I am ready. I just have a good feeling about today. Great antiques, and after such an intro, I'd better live up to it. Well, we have a dozen of these wonderful antiques and collectables behind you. would you please tell us what lots we're playing for today? but they will walk away with the cash equivalent of one of their items. lot, which is about £10 or less. And that, obviously, is the lot to avoid. So who's playing today? Let's meet our teams. Welcome, team one, who are you? I'm Graham, and this is my friend Ian. I'm Ian. We met as teachers in 1978, and Graham was my boss. Really? Who's the boss today, then? Welcome, team two, who are you? Hello, Fern, my name's Leslie, this is my lovely wife, Susan. we worked together in our own furniture manufacturing business. and I'm from a town called Hinckley in Leicestershire. I'm with my grandson, James. And I'm also from Hinckley in Leicestershire. Well, I wish all three teams lots of luck. And let's get a game going. but they didn't know they were being watched over by our expert. Could the teams separate gems from the junk? I would have thought that was late Victorian. I don't really know much about clocks. -An impressive piece. That's nice. Oh, it's an old bicycle. Still got the bicycle pump on. Could be a First World War, or 1920s, '30s, a little bit later. They haven't noticed that it folds. -Not many people collect bikes, do they? -I don't know whether I like that or not. It isn't signed, is it? -And they're right, it's not the original one. That, I wouldn't think, is worth very much, to be honest. I know my wife likes them. It could be white gold or platinum with diamonds. -Yes, yes, ammonite, isn't it? -You'd see that in a car boot. -Don't call me a fossil. -What do you think it's made out of? -I wouldn't think it's gold. It's not gold, according to Graham. I think that is solid silver. I think the anchor, I think that's when it's made in Birmingham. -Well, you could buy that in IKEA or somewhere. Got to find out if it's a first edition. Two teachers intrigued by a book. Notice if it's done with gold leaf, look, around it. That's not the Titanic, is it? Oh, no, Queen Mary. Three red funnels. -I don't know if it would go in water, though. -It would have rusted by now. -It is an actual dog collar. -It is a dog collar. Yeah. -I suppose it's not hard to figure that out. -I don't think any dog would enjoy wearing that much. It says it's a sundial, but it looks like a compass. I don't think I've ever seen anything like that before. -This would date to 17-something. -I'll be quite honest, there's a few I haven't got a Scooby-Doo about. -Top lot, I think, is the clock. The clock looks a very good possibility. -I like the bike, actually. The ammonite is the least expensive. -I've dug them up in my garden. -I don't like the collar. -Yeah, that wasn't as easy as one expected. -No, it wasn't. It wasn't. Natasha, what do you think of that? I loved watching it. I can't believe that none of you knew. I felt so sneaky. Watching it was horrible, but so fun at the same time. And do you know, all of you were completely different. Some of you approached it by, "How much is this going to be worth?" And some of you just whether you liked it or not. -So it'll be interesting to see how this plays out. -"How do we arrive at the valuation of the lots?" -Well, it's a joint decision. achieve at auction, but with no auction costs added. OK. And just to add an extra twist, we have our mystery lot. But now, it's time for round one. All clear? Pickers, please make your first pick. Graham and Ian have gone for the clock. Susan and Leslie have gone for the clock. James and Alison have gone for the painting. So, quizzers, fingers on buzzers. Question number one, here we go. In which decade did Neil Armstrong become the first man to set foot...? In which decade did Neil Armstrong become the first man to set foot on the moon? Correct, well done, the clock is in your collection. OK. Pickers, would you like to pick another lot, please? and James and Alison have gone for the book as well. That means you are frozen out of the next round. You do not get to pick anything, and the book goes back on the grid. Graham and Leslie, please make a pick. Both gone for the book. a competition was famously created in which sport by Samuel Ryder? Correct, the book is yours. OK, everyone's back in play again. So, pickers, choose a lot. Susan and Leslie for the necklace, and James and Alison the stamp case. Tom Cruise jumped up and down on the sofa of which US talk-show host? It was. The talk show host was Oprah Winfrey, well done. OK. Pickers, make a pick. Ian and Graham have gone for the cocktail shaker. Susan and Leslie sticking with the necklace. James and Alison have gone for the bike. Here is the question, quizzers. It is turquoise. The necklace is yours. But Susan and Leslie have gone for the oil painting. James and Alison, however, have gone for the oil painting. Here's the question for the quizzers. The Great Barrier Reef lies off the coast of which Australian...? The Great Barrier Reef lies off the coast of which Australian state? -Are you pleased with him, Graham, so far? -Very good, and keep this up. Yeah, it's a fluke. It's a fluke. Well, it might be. We don't know, do we? OK, here we go, then. This is the penultimate pick, pickers. James and Alison for the stamp case. orienteering? It is the compass. you've got the stamp case. And this is the final question in this round. Susan and Leslie like the look of the cocktail shaker. a salade nicoise is made from tuna and which other small fish? Get in! Yes, it is anchovies. The cocktail shaker is yours. So at the end of round one, let's see who's got what. Susan and Leslie have the necklace and the cocktail shaker. And James and Alison, you have the stamp case. which should give them everything they need to know to make a valuation. I was interested in Troika pottery for many, many years. I thought it was incredible stuff. It was so different and so unusual. That's sort of like the slabs that are put together, isn't it? -And then something called Lipper, Leper? -Well, again, it's Cornish pottery. It's quite an unknown potter. And I went into Ian's class on one occasion and he had some Troika there. And he also had a manual from an exhibition, which identified Leaper. "I'm going to collect Leaper," and it just grew from there. -or still on the board. -I think I'd like to know more about the book. The Water Babies by Charles Kingsley. It was first published in 1863.
suggesting that the covers or spine were once loose. believe it or not, this copy may never even have been read. Susan and Leslie, tell me more about your furniture designing. What sort of style were you making? Well, I was more of, perhaps, a maker than a furniture designer. But I did a three-year degree course at the London College of Furniture. In the late '60s, early '70s. where we were making pine and painted furniture. OK. What lot would you like to hear more about? I'd like to hear more about the sundial. The sundial, yeah, interesting. It's like a pocket one, isn't it? and it's actually of European origin. and it was an easy way to tell the time. which at the time would have been comparatively very expensive. which is protected by the surrounding brass body. I think a few of you were wondering what it was made of. and still has its original case. The question is, will it lead you to success? So, Alison, James is the model grandson, would you say? He's an absolutely wonderful grandson. And I hear he brings you cake and flowers. -He does. He's very considerate. -James, I am almost a grandmother. -Have you brought me anything? -I was getting to like you. It's gone now. Right, what would you like to hear more about? I'd like to hear more about the model ship, please, the Queen Mary model toy. that sailed from 1936 to 1967. Now, the toy is quite small at just over 30 centimetres in length. and a basic mechanism to propel the boat forward. But the paint is chipping. It looks a little worn. as the key is missing from the wind-up mechanism. So it's not set to go. But the toy's history may tempt you to sail away with this lot. OK, it's time to play round two. and the quizzers will, again, try and secure it by answering correctly. Let's have a look at those categories. you could choose between football and outer space questions. the team with the least valuable collection will be eliminated. So choose as wisely as possible. Team one, you are up first, so, Graham, pick a lot for me. Well, Ian, football or outer space? -Outer space, here we go. What was the nationality of the first woman in space? -Yes, the bike is yours, well done. Susan and Leslie. Leslie, would you like to pick? I'll have the cigarette case, please. Cigarette case. Susan, British art or rivers? -British art, here we go. It is blue. The famous Blue Boy. So the cigarette case is coming into your collection. Very good. James and Alison. Alison, this is your turn to pick, what would you like? -I've got to go with the ship, haven't I? "The Wizard of the Dribble?" So, unfortunately, the model ship doesn't come to you this time. their collection. So you're safe, James and Alison, with your stamp case. So, Graham, do you want to pick from the grid, or steal from a rival? -The necklace from Susan and Leslie? Susan and Leslie, which category which you like to choose for Ian? of an Oscar in which category? Oh, well defended, Susan and Leslie. The diamond necklace is still yours. Leslie, would you like to steal or take something from the grid? I would very much like to steal. -I will have the clock, please. The clock is in Ian and Graham's collection. Ian and Graham, what category would you like to pick for Susan? Which artist had her first UK number one single in 1977 with I Feel Love? -Well done. You've got the clock. -or would you like something from the grid? I'm still going for the ship. Good, OK. James, football or rivers? -I'll try football again, please. -Football again, here we go. The goal-line is located how many yards away from the penalty spot? You've got the model ship into Alison's collection. OK. We're going to do the same again. So, Graham, steal from someone or pick from the grid? Yes, I think we'll have a go at stealing. -Would it be the clock? OK, Susan and Leslie, you've got to pick a category for Ian to answer. what is the name of the longest river in France? Susan and Leslie, what will you do, steal or pick? -I wonder what it could be. Ian and Graham, what category would you like to give Susan? -That could be a low blow, yes. that came to be known as "the hand of God"? -I don't know a thing about football. are you stealing or taking one of the last two things on the grid? The dog collar or the fossil? -I'll steal the necklace, please. Susan and Leslie, you've got to defend the necklace. So what category would you like to give James? of the industrial areas around Pendlebury and Salford? Well, I'm so sorry that you are not winning the necklace for Alison. That's the end of the round. Let's see how the collections are looking. the clock and the oil painting. the book and the cocktail shaker. And James and Alison have the stamp case and the model ship. OK, for one team, sadly, it's the end of the road. be eliminated. So, Natasha, who is leaving us first? but the items you've had in your collection are eliminated, too. you want to find out what your collection is worth. Now, the stamp case was invented by Lewis Carroll himself. It was designed for holding stamps, of course, of all denominations. from Carroll's own Alice's Adventures In Wonderland. so it's not the earliest example that you can find. as you saw, is rather torn. And as a result, what's it worth? I think you all loved that one, but you loved that ship. Alison, you had to have it. You fought for it, as well. nobody else really was interested in it. Just you, I have to say. The boys and their toys, not so drawn to it. But were you drawn to a very valuable lot? So altogether, the total value of your collection was £260. James and Alison, it has been a delight to have you here. but say thank you for playing For What It's Worth. we're now going to say goodbye to the things left on the grid. Only two things, Natasha. Would you like to tell us about them? I'd love to tell you more about them. and it dates to the early 19th century. of the pampered pooch in England. and as objects to spoil and treat. a little bit of bite to your collection? We're still talking species, but we're not talking animals. and the end of the dinosaurs themselves. as they are the youngest, and usually the most well preserved. Nothing at all, no value whatsoever. which means the top lot is still here somewhere. Team one. Ian and Graham. cos you dismissed it, the necklace. You just said, "It's paste." Well, it's an Edwardian diamond necklace. And it dates from around 1900.
it's a very fine example of the time. It's made of... 18-carat white gold. And the weight of the diamonds is 1.8 carats. So how will it weigh in when it comes to its value? Food for thought, Ian and Graham? -And possibly for Susan and Leslie, too. Susan and Leslie, what would you like to know more about? We'll go with the oil painting. The oil painting please, Natasha. waiting for the superlatives, and all I got was, "nice", "decent". who lived between 1894 and 1959.
which you may have seen, The Rowers. and the painting has clearly been sold and reframed several times. which is clearly a much later addition. -It's time now for our final round. I'm going to show you a category and 12 possible answers. Nine of the answers are correct. Natasha, who has the most valuable collection at the moment? and the end of the war in May 1945? Ian and Graham, would you like to go first or second? OK. Let's reveal the possible answers. Ian. Would you give me a correct answer? If it turns green, you're OK.
Well done. Susan, your turn. I'm afraid fish is incorrect! Where were the right ones? Fish, wood and cauliflower were never rationed. Therefore, Ian and Graham, you may steal from Susan and Leslie. The diamond necklace is now in Ian and Graham's collection. Susan and Leslie, here you go. The question is species of butterfly. You need to spot the names of butterfly species. Nine of these are correct. Three of them are not. Can you see a correct answer there, Susan? I'd like to pick Painted Lady. Painted Lady. Let's have a look. Seen them in my garden. Well, that's why Susan is your quizzer, of course. Let's have a look where the other incorrect answers were. Spotted Chorus. I'm afraid that's a frog. Busy Lizzie, of course, is a plant. -And Heather Shimmer is a lipstick colour. I think we'll have the book back. The book is on its way. Here it is. Roald Dahl characters. for children? Ian and Graham, first or second? OK. Let's reveal the answers. Can you spot the correct ones from the incorrect? Ian. Give me an answer. I think I recognise Veruca Salt. Yes, of course that's correct. Susan. Give me an answer. I think Jennifer Honey was Miss Honey the schoolteacher in Matilda. -This is a guess now. -Correct, that is also from Matilda. Let's have a look. Yes! BFG. The Big Friendly Giant. -in Charlie And The Chocolate Factory. Yes. And it is Charlie And The Chocolate Factory. -so I'll go for that one. You've got a 50-50 chance. Three are correct and three are wrong. -He's a Charles Dickens character. Oh, well. Let's have a look at all the answers. Everyone else was a Roald Dahl character. What would you like to steal from Ian and Graham? This is a big moment. Last steal of the game. -It's one of three things. It's either the necklace, the clock or the sundial. -You don't think the book, because it was the first edition? -Or the book. You choose. -Do you want to go for the book, then? -Yeah, go for the book. -so we'd like to go for the book, please. The book is now yours and it's in your collection. have you at home? - what has happened here. Natasha, who are today's winners? Well, commiserations, Susan and Leslie. You did not create a valuable enough collection. we want to find out what your items are worth. Natasha. Let's start with the cocktail shaker. Now, Leslie, straightaway you spotted it was silver. Not everyone did. They had to kind of look for those hallmarks. You knew it was silver. You knew it was Art Deco. And you were bang on with that. and it was made by Turner and Simpson. That was the "T and S", the maker's mark, circa 1934. They were quite prominent in Birmingham as silversmiths. but they are also quite simple to manufacture. and it's also in top condition with no visible damage whatsoever. Leslie, you said a few hundred pounds? You were right. £600 to be exact, so well done. And then we moved on to the book. Now, as soon as I said first edition, you were really dithering. "Do we go for the clock? Do we go with the necklace? "It's got to be that book, because of first edition." But it's rarity that counts. the book is only worth £100. Can you believe that? £100. 1863. Anyway, let's move on to that cigarette case. -Now, everyone dismissed this as gold plate. ..Art Deco cigarette case. Guffaw there from you, Leslie. so it's marked 375 for nine carat gold, meaning it's 37.5% pure gold. But it has its original soft case that goes along with it. You didn't quite think it was solid gold, but it is. -I know, it is a wow, actually. So, well done, well done. But there was some very good choosing there. for playing For What It's Worth. Well done, Ian and Graham. All you've got to do now is claim your prize. and then we will give you the value of whichever you pick in cash. So, talk amongst yourselves. Which one would you want to choose? I think the necklace was already in their collection. And that, even with that in their collection, didn't help? It didn't help to outbid us. Yeah. Good point. Because the oil painting, it wasn't a professional. or something, which I don't think it did. -The clock and the sundial. -I still think it's the clock. -You think it's the clock? -So, shall we just go with the clock? -We'll go for the clock. -Final answer is you've chosen the clock. Natasha is going to tell us what you haven't won. Let's start off with the bicycle. And look, here it is folded out and there it is on the screen folded up. Invented in late 1943 by BSA Cycles in Birmingham. amazing to think - down to accompany paratroopers. the bike is unfolded and it's good to be ridden off to face the enemy. and sometimes they became valuable collectables. At £800, I would say the latter. and discussed and discussed, but do you know what? I was watching you two hum and haw over this painting. Neither of you liked it. But there is something about the realism of it. It's the subject matter that counts here. And its value is in four figures. It weighs in at £1,200. So not the top lot. then, "Hang on, maybe it's paste." your eyes started to sparkle. But is the price as sparkly as those diamonds? -Am I going up in value? -To £700 for this necklace. I think you knew it wasn't worth a huge sum, the necklace. this is something that would have piqued your interest. and asked them to discuss it. You know that they would have loved it. You are out of rough seas, don't worry. -So, you've done the right thing! You chose the clock, Ian and Graham. It's today's most valuable lot. It's worth £2,500. Well done. -We have the mystery lot lurking under the red cloth there. And that could be worth even more. Oh, Ian and Graham, you've done so well. Here is your lot. Take a good look at it. because you chose our top lot. we like to tempt you. Would you swap it for something that might be worth even more? Our mystery lot. Natasha, what have you got for them today? I'm going to get a steady grip on it. A Chinese purple glass vase, as you can see. are moulded with 100 characters. Now, those are "shou" characters written in various scripts all over. Now, the Chinese character "shou" stands for longevity. Very important in East Asian culture. for her role in the transfer of sovereignty over Hong Kong. Now, Margaret Thatcher was obviously a very polarising figure. Many loved her and many didn't. So what does her connection do to the value of this vase? It could be worth millions. It could be worth nothing. was turned down recently for a museum, but I don't know. That's the only thing it's got going for it. -And sentimental only to her. But that, I think, is beautiful. So, your final decision is...? -Keep the clock, dump the vase? and tell you the worth of the vase. because haven't you heard about the East Asian market? But Graham, you just said something really important. You sort of said it in a flippant way. You said, "it's history". "It's just a bit of history." But it's history. It's the way you play it. This...the Iron Lady herself was presented this vase. You had today's top lot. Someone put the kettle on, please. Right, OK. Do you want to hear a little bit more about the clock? -What can you tell us? are serious 17th and 18th century designs. with just one clock. It's cracking. And that money is yours! Ian and Graham, you played the game absolutely spot on. -Lovely to see you, Natasha. -I hope to see you again soon. to try and spot the lot to win the lot on For What It's Worth. I'll see you next time. Goodbye for now.